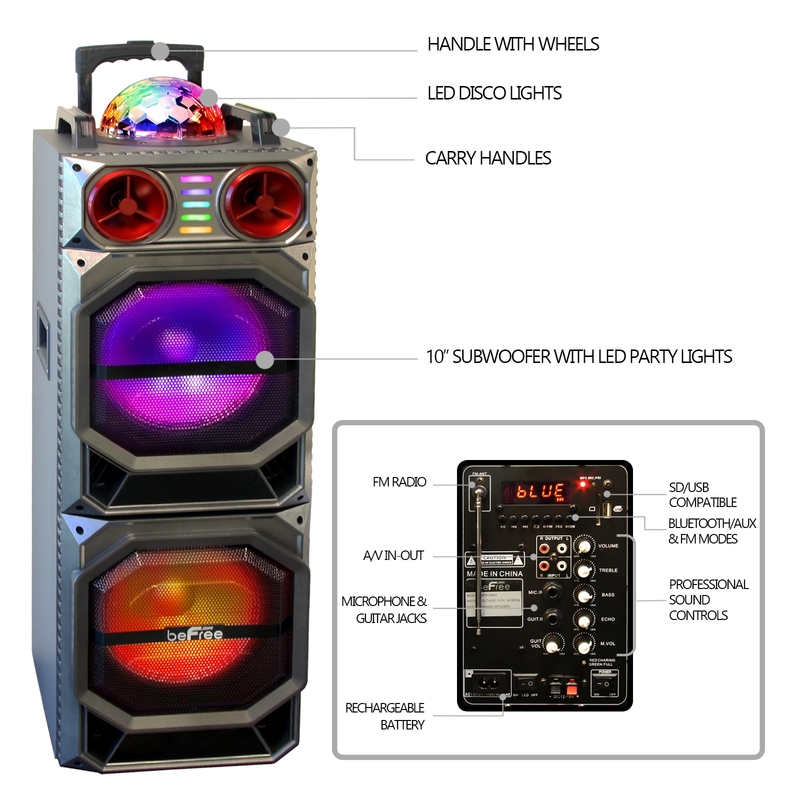 The new Befree Sound Dual 10 Inch Subwoofer Bluetooth Portable Silver Party Speaker With LED Lights, USB/ SD Input, Rechargeable Battery, Remote Control And Wireless Microphone is an all in one entertainment assistant for the most advanced entertainers around! This easily portable speaker includes hard mounted top handles for your convenience, and boasts a large frame to ensure its highly visible. 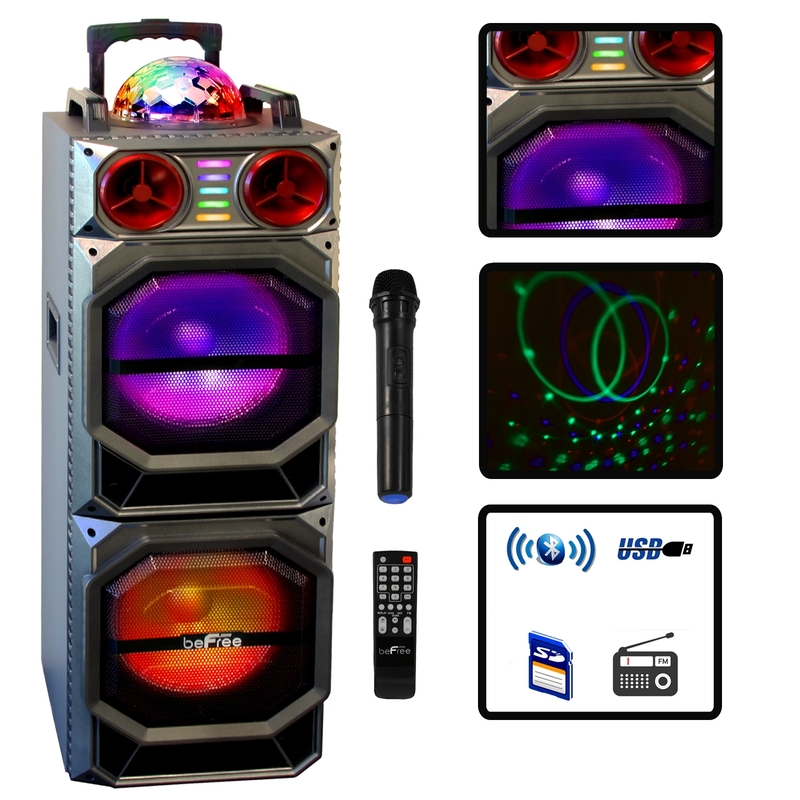 With such a Colorful Light Show Display, this sound system is sure to pump up the party in whole new way. While your guests may already enjoy your music selections, this speaker will help you take your entertaining to higher level. You can connect a variety of devices, and choose the input that is best to suit your needs. You always have the option of turning down the reactive light show for those more subtle gatherings and allowing yourself to enjoy the strong, clear sound provided by the Dual 12inch Subwoofers. EASILY CONNECTABLE: beFree has your convenience in mind! Bluetooth may be your favorite connection, and we understand, but there are times when other options are needed. 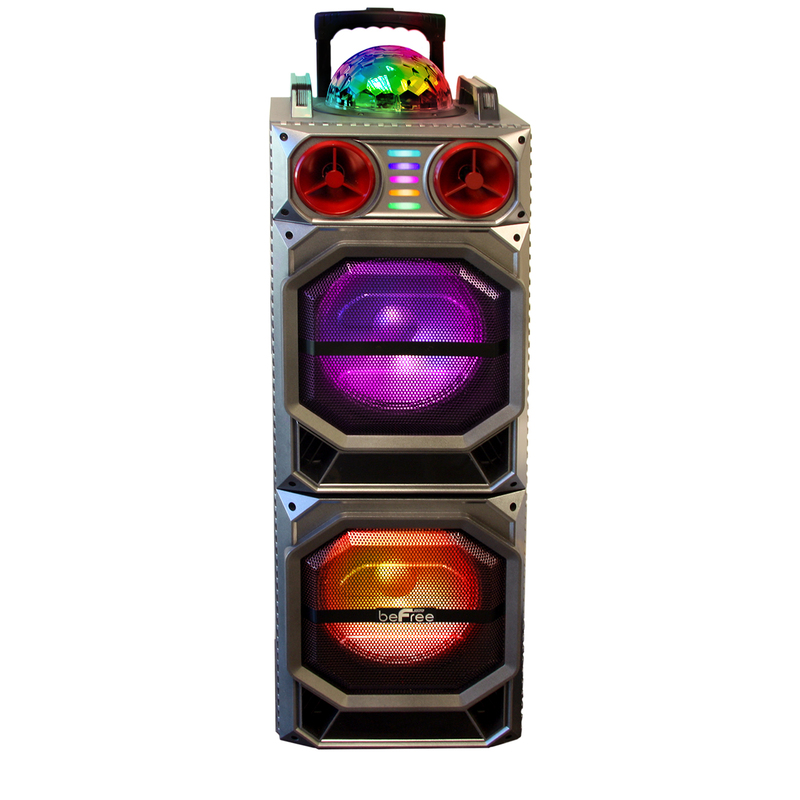 With you in mind, beFree Sound has jam-packed this ultimate party speaker with connections to ensure you have every option you need. This Speaker offers USB, SD and AUX Inputs. 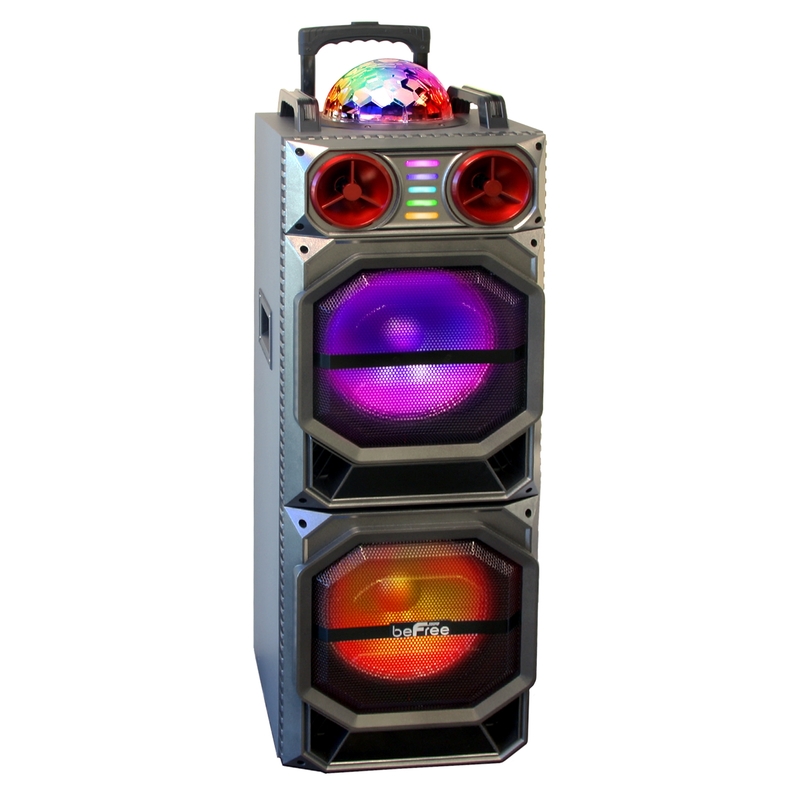 It also features a Microphone Jack for your wired microphone, or your can connect the included wireless microphone and feel free to move around while you dance and sing to your favorite karaoke tunes! 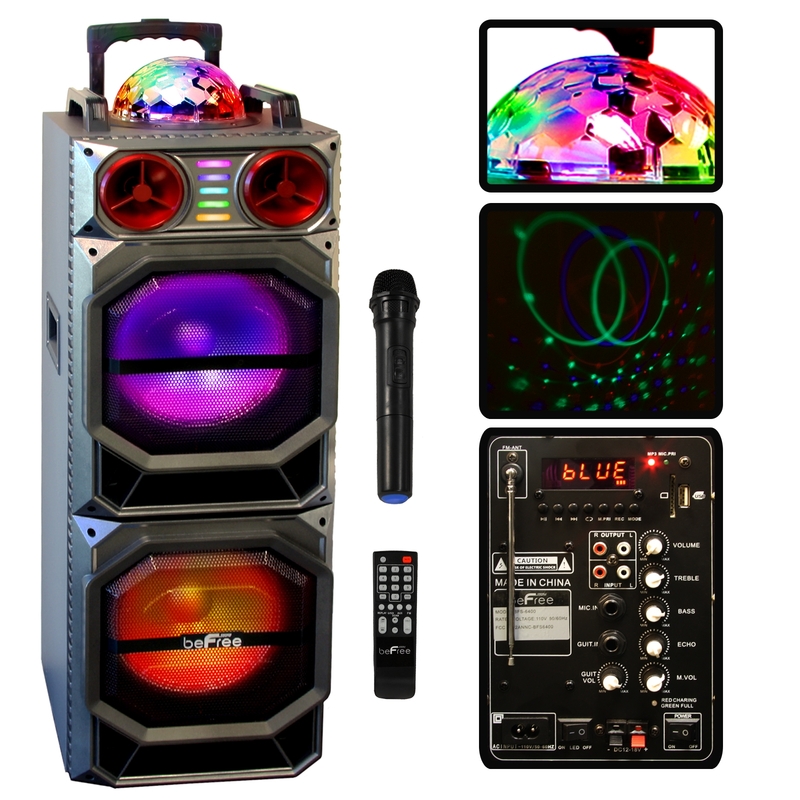 DUAL LAYER REACTIVE PARTY LIGHTS: The Party never stops while this speakers light show is wowing your guests! There are two layers of individually reactive lights which change colors and move to the rhythm of your favorite tracks. While you may have had other party lights in the past, this speaker is sure to amaze and entertain with it’s unique style and brilliant lights. This Amazing Speaker even projects moving lights onto the ceiling with its Top Mounted Light Projection Dome! EASILY PORTABLE: Hard mounted handles, and Dual Rolling Wheels make this unit easy to transport and handle. Designed with your convenience in mind so that you’ll never have to leave this speaker behind! STRONG CLEAR BRILLIANT SOUND: This speaker won’t impress you with it’s size alone. The 10 inch Double Subwoofers offer a thunderous and thrilling power of this speaker will ensure that your guests will be moved by the music even if they lean against the walls!